This section explains object types and their corresponding processing and exclusion options that you can select when creating and configuring a backup job in Veeam Backup for Microsoft Office 365. Consists of Office 365 groups (available only in Microsoft Office 365 organizations), security groups, distribution groups and dynamic distribution groups. Consists of shared mailboxes, public mailboxes and users. Consists of Microsoft SharePoint sites and subsites. Consists of organization objects and their corresponding processing options. 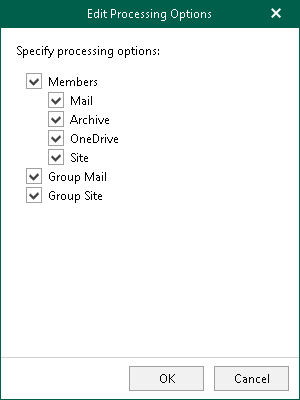 Each of these object types consists of a set of processing/exclusion options such as Mail, Archive, OneDrive, Site, Group Mail and Group Site which you can select/deselect to make data retrieval even more precise. Processing and exclusion options can be selected at the Select Objects to Backup and Select Objects to Exclude steps respectively. The following table lists available Group types and their corresponding processing/exclusion options. 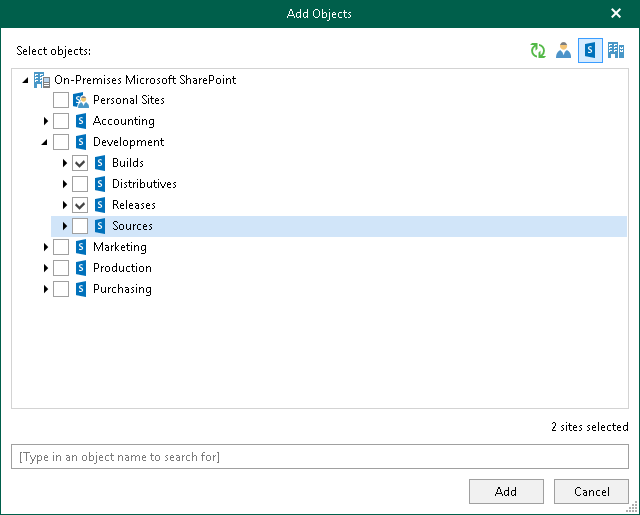 Groups are not available in on-premises Microsoft SharePoint organizations. Current version of the application supports mail-enabled security groups only. The following table lists available User types and their corresponding processing/exclusion options. Objects of this type do not have any processing/exclusion options. Objects of this type are not available in on-premises Microsoft Exchange organizations. You can only select either the root site, or any of its subsites. As an example, in the following figure you can only select either the root Development site, which automatically selects all of its subsites, or you can select, for example, Builds and Releases. In the latter case, the root Development site will be deselected. The following table lists processing/exclusion options available for Organization types.